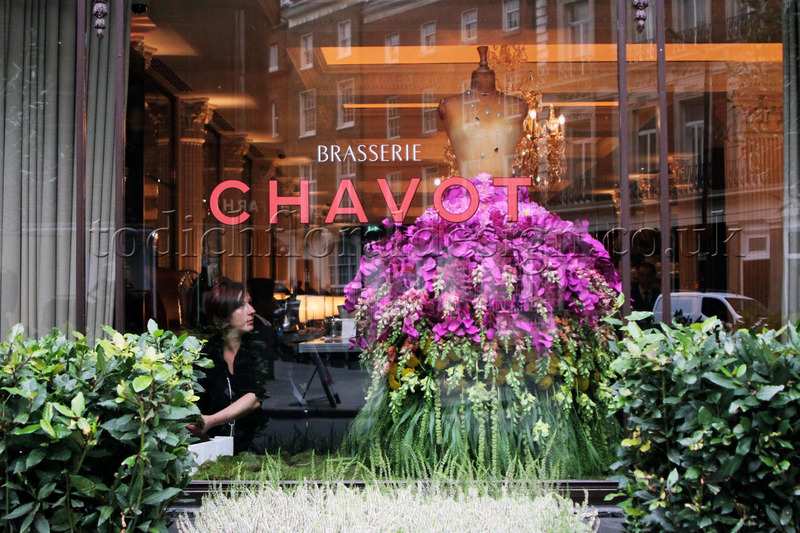 To mark the beginning of London Fashion Week, corporate floral designers at Todich Floral Design have created a show-stopping window display for Brasserie Chavot. 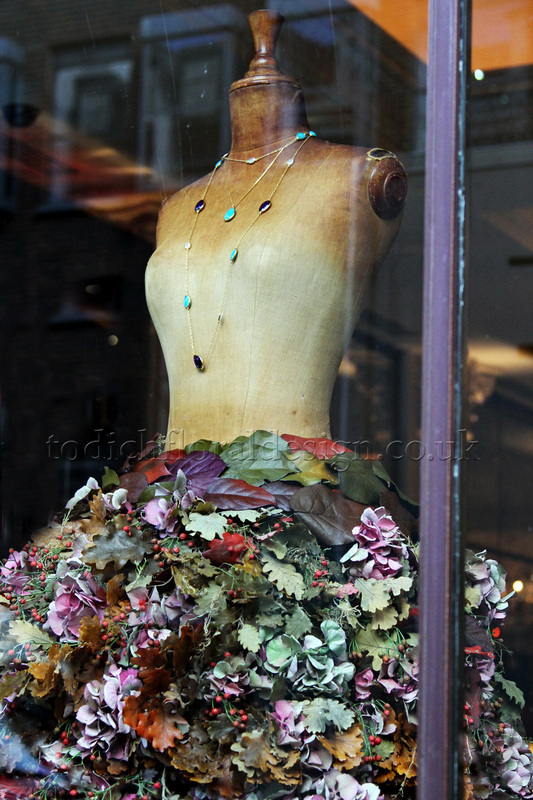 During this prestigious fashion event that brings fashion designers, writers and models flocking to the capital, a beautiful floral dress will take centre-stage in the windows of this central London restaurant. Fashioning a living dress. 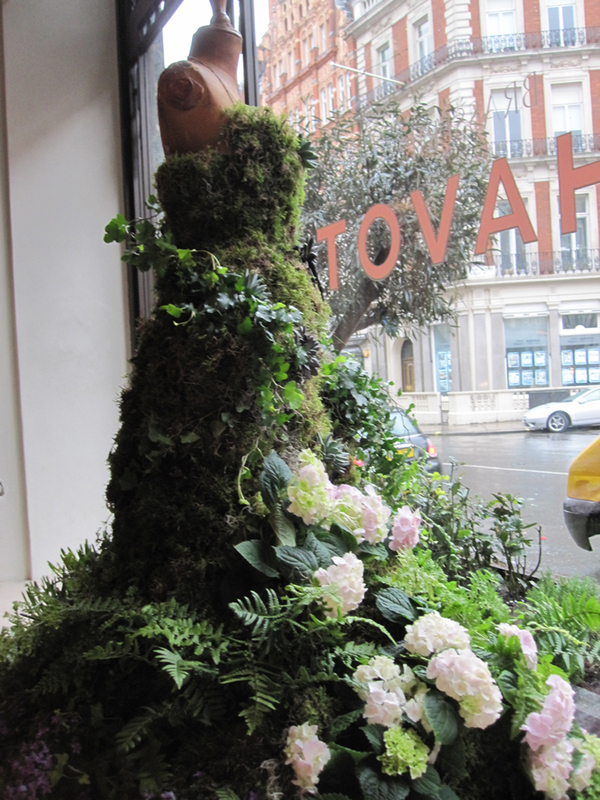 Inspired by the colours and new life of spring the Todich Floral Design team, lead by Todd Z. Todic, have created a living dress made of plants and flowers to adorn the windows of this Michelin starred restaurant. 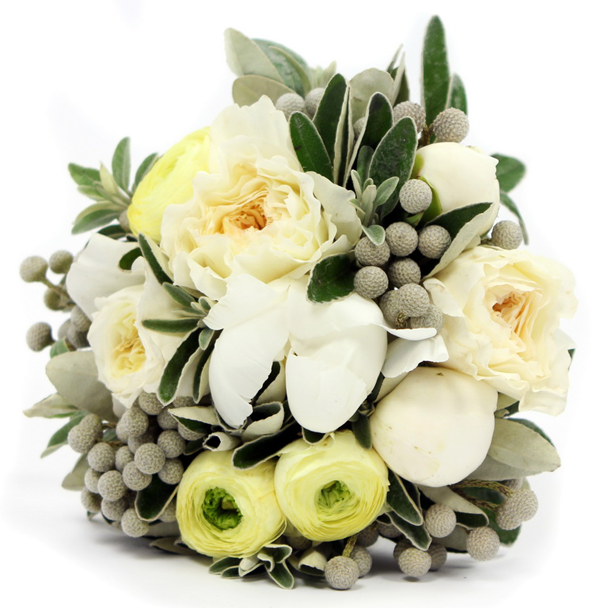 An antique manikin was the start of the creation: a fitting base for the natural adornments. 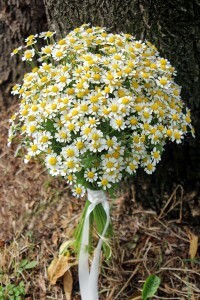 The frame of the dress was fashioned from chicken wire, while natural sphagnum moss was used as a dress filler and fine carpet moss attached to the front of the garment. 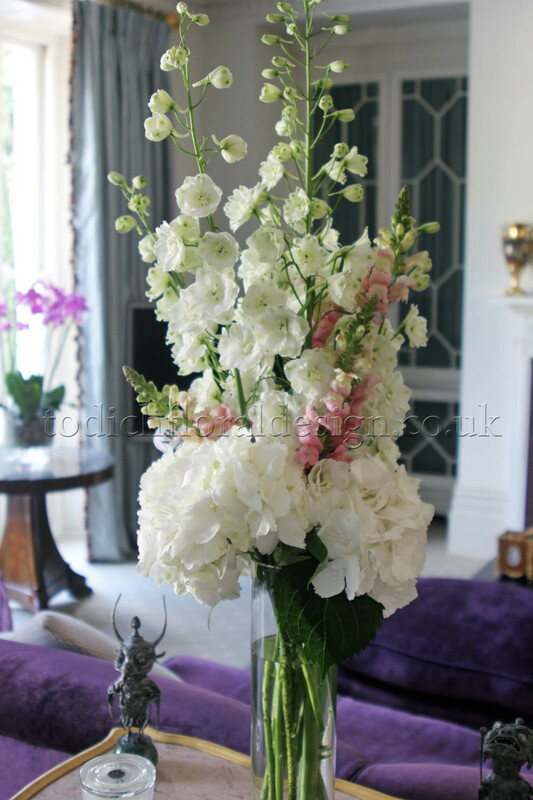 Then came the embellishments: light pink hydrangeas to add bright but harmonious colour to the greenery and convey the promise of spring, with ivy and ferns winding round the figure. 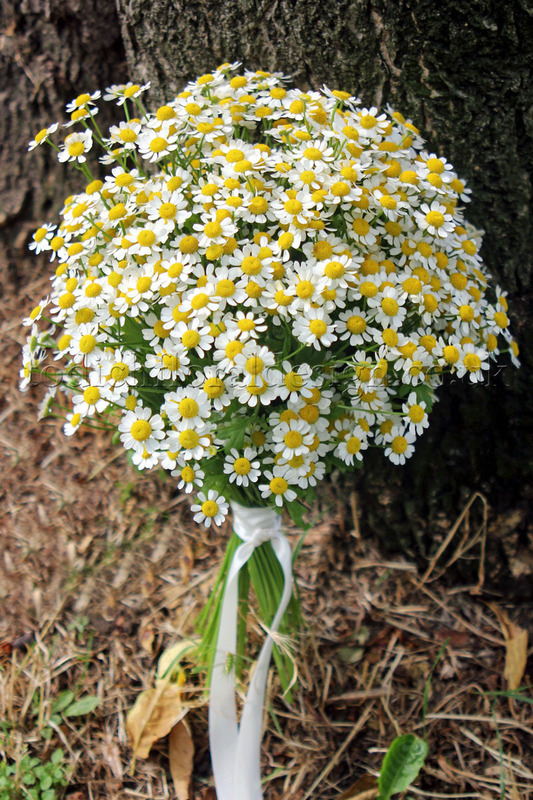 And the dress doesn’t only serve as a magnificent decoration for the restaurant: herbs have been incorporated into the creation so that chefs can pick and choose them for their meals. 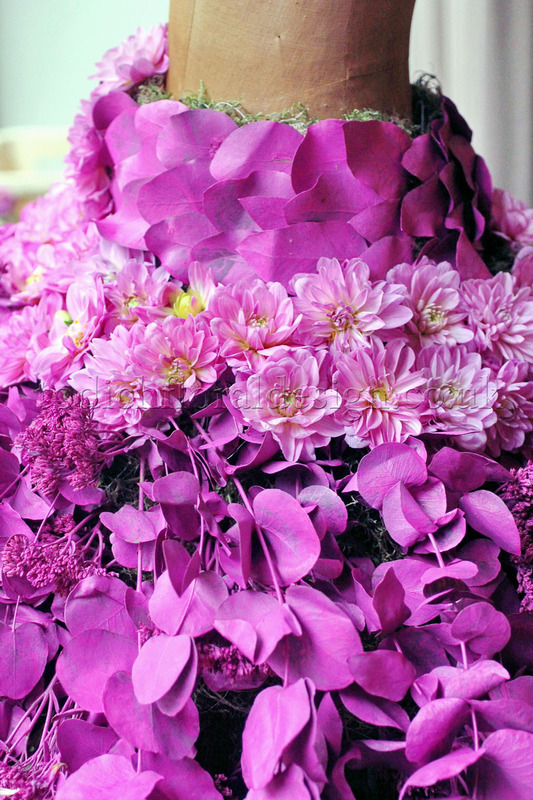 They will be literally ‘cooking the dress’ throughout fashion week! 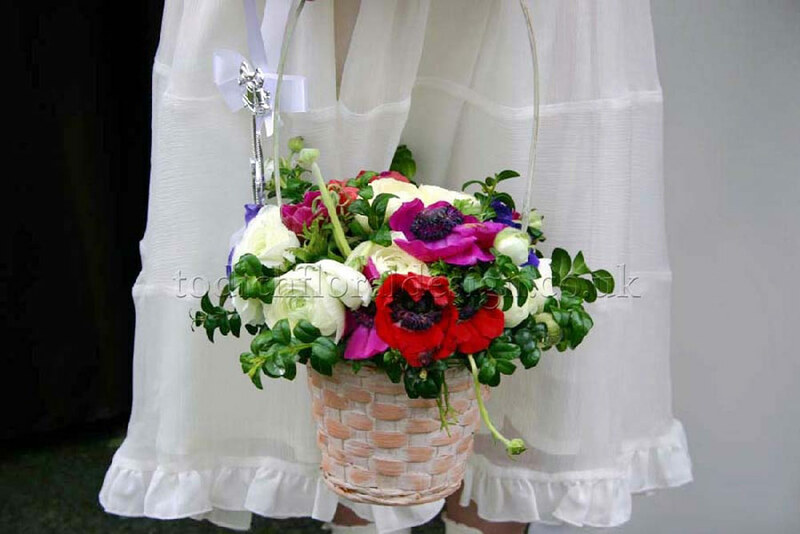 The finished result is a truly stunning creation that is bound to have passers-by, whether interested in fashion, flowers or just beautiful things, stopping and staring at this unusual display. A perfect partnership. 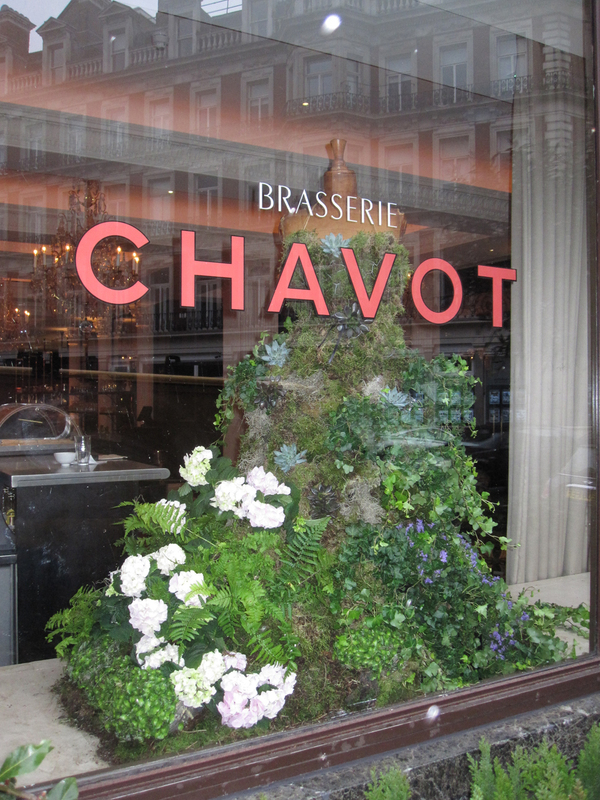 Todich Floral Design regularly creates window displays for Brasserie Chavot, who always have a large window display filled with flowers, plants and herbs. 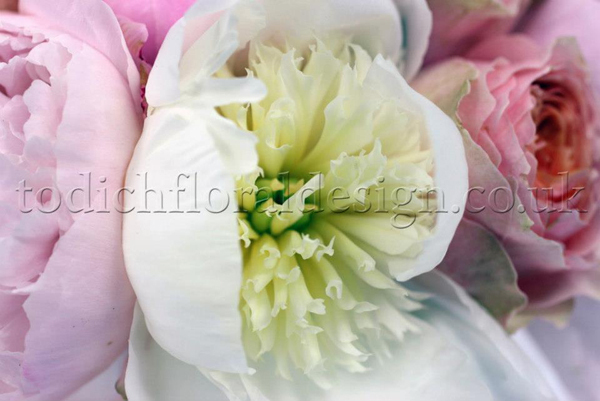 With fashion-lovers arriving in London this week to see the best and brightest designers displaying their creations, focused at the neoclassical Somerset House, this is the perfect opportunity to create a display that marries floral design and fashion. Though London Fashion Week is in it’s 61st year, there’s every opportunity for visitors to the capital to still be wowed. 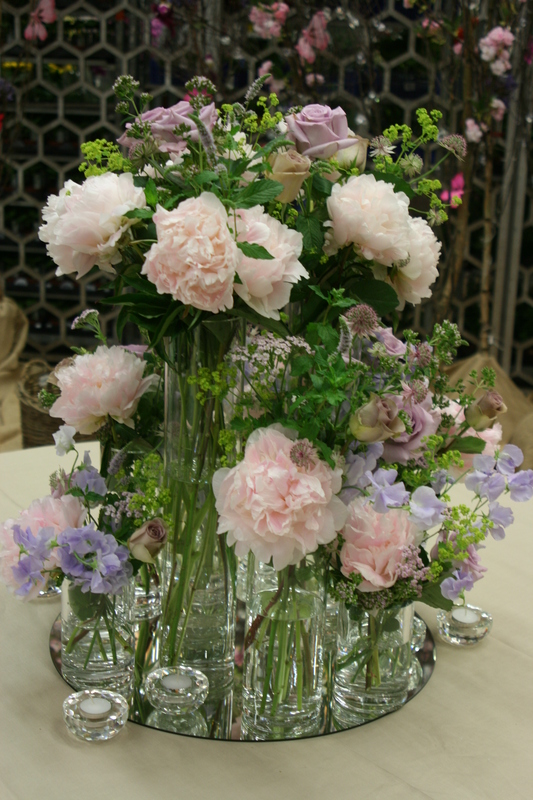 Event florist Todich Floral Design are experts in creating event and corporate floral displays, and understand how to best reflect the artistry and passion of Brasserie Chavot. The restaurant boasts rave reviews and is considered the top-end of fine, French dining in London. 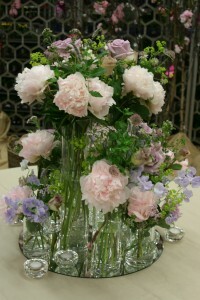 A window display to reflect the quality of the food, skill of the chefs, and the special experience of eating at the brassiere was key to creating this floral window display. 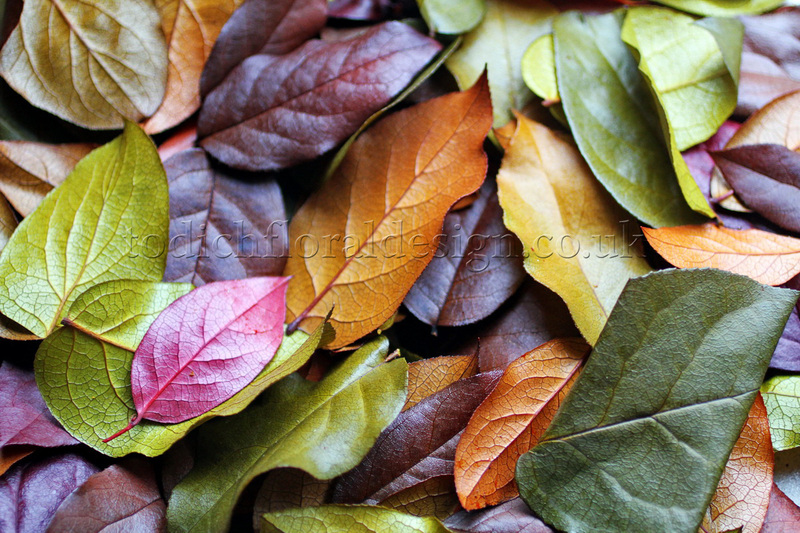 We’ve been thrilled to work with this restaurant and look forward to designing future, seasonal displays. 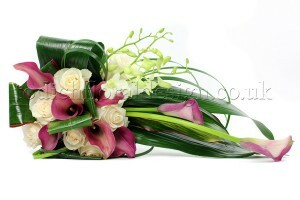 About Todich Floral Design. 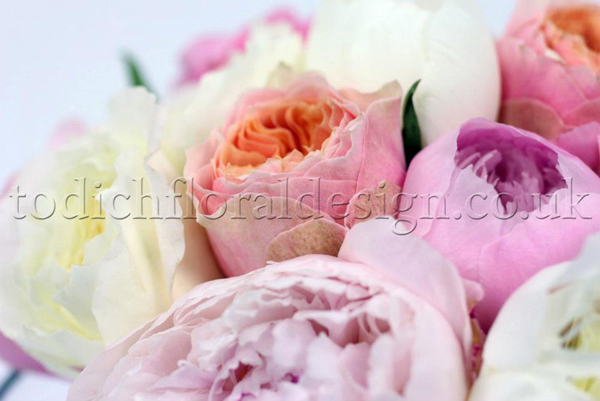 With 15 years experience creating beautiful floral displays for events, restaurants, bars and hotels, you can trust Todich Floral Design to create impressive displays to suit any tastes and themes. Please drop us an email at events@todichfloraldesign.co.uk or call 0207 737 1116 to discuss your floral needs. In the meantime, take a look at the displays on our website for inspiration and to see what kind of fabulous arrangements we can create. 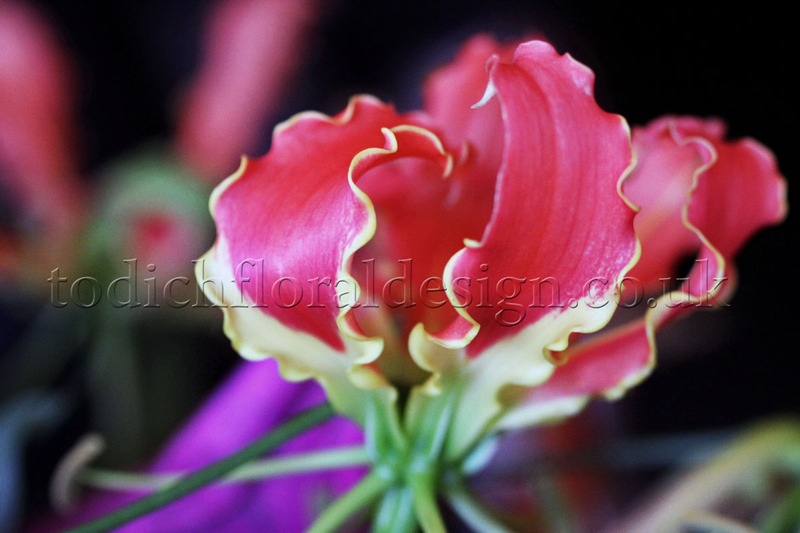 If we can bring to life a dress made of flowers and plants, there’s no limitation to your, and our imagination and what we can create! 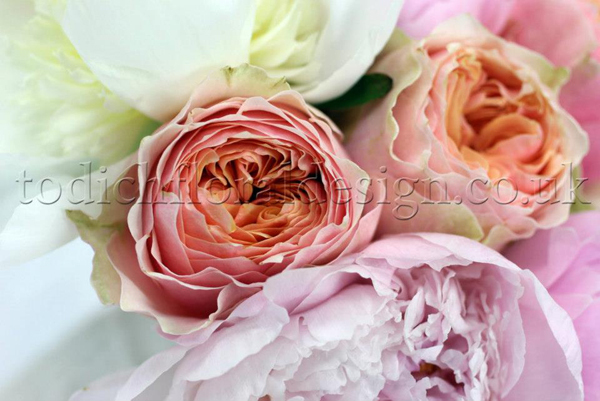 Todich Floral Design loves a summer wedding; there is a vast variety of flowers available during the summer season that is perfect for weddings and events. With flowers such as hydrangeas, cornflower and delphiniums available it’s no wonder our florists love to create unique summery designs. 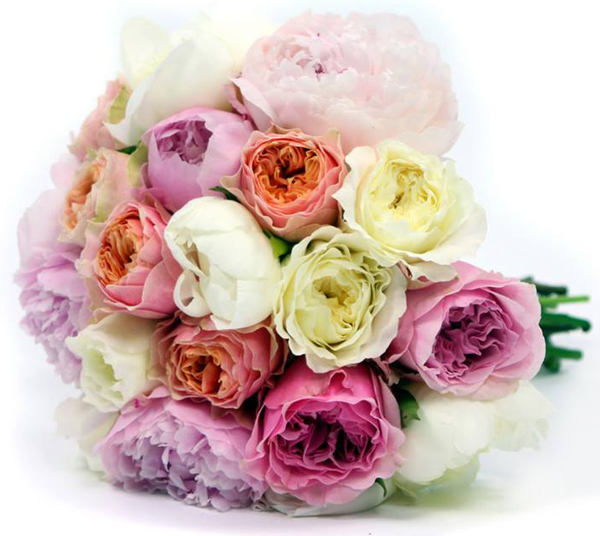 For a hot and hazy summertime wedding, it is always best to opt for elegant blooms in shades of pinks, purples and blues; these colours really stand out in the sunshine and create a beautiful backdrop of colour at many English Venues. 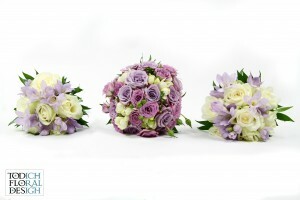 Todich Floral Design had the pleasure of designing the flowers for a wedding being held on August 20th 2012 in Battersea, London, The bride’s favourite colours were lilacs and purples and her favourite flowers were roses and orchids, it was a requirement to include these into her bridal designs. The overall colour scheme was a fusion of purples and lilacs, the bridesmaid’s dresses were deep mauve and the bridal dress was a blend of ivory and white. 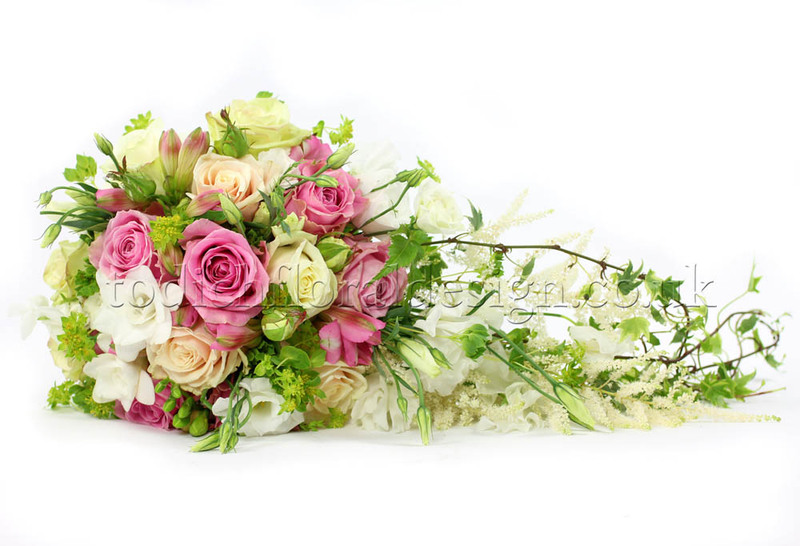 The bride has a petit frame and we found that a posy style bouquet suited her style best, we created a bouquet containing ocean song roses, ocean mikado spray roses and scented white freesias, and we then finished the design with small diamante pearls and white satin ribbon. The bridesmaid’s bouquets were of a smaller hand-tied design and included cream roses and purple freesias and were finished off with white pearls and satin ribbon. 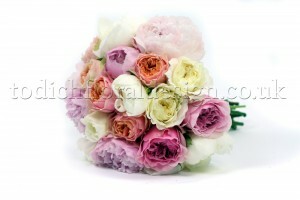 The bridal bouquet and the bridesmaid’s bouquets looked beautiful when held next to each other. 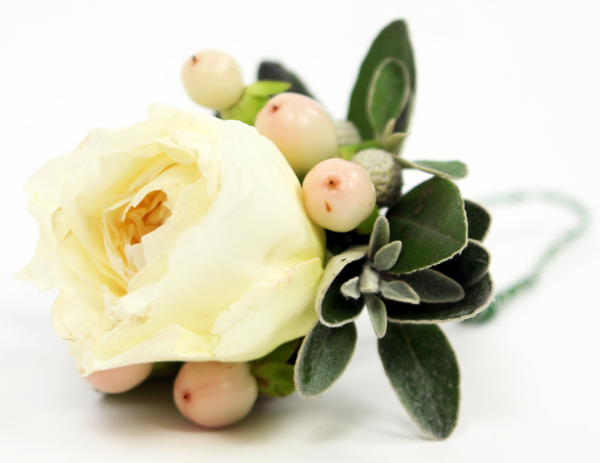 The groom’s boutonniere was a simple elegant design that matched the bridal flowers; the floral piece was made with a lilac ocean song rose, small lilac spray roses and finished with seasonal foliage. 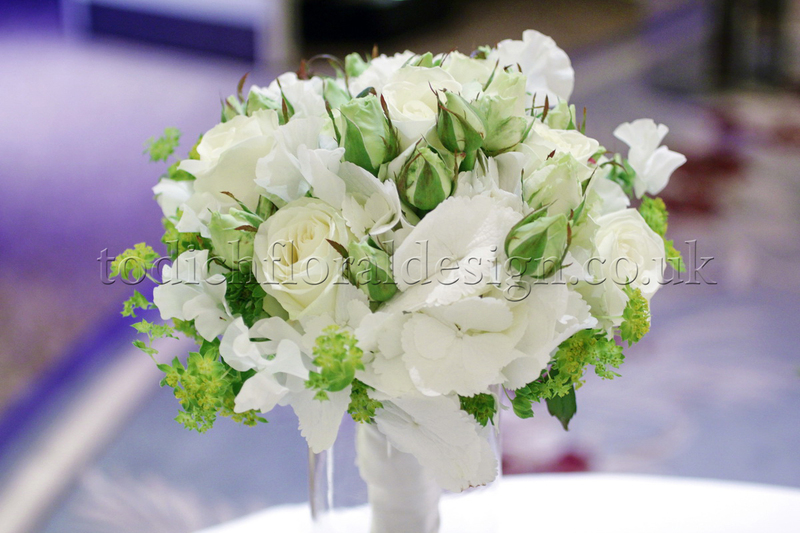 The reception was held at London’s Hotel Verta, a popular wedding venue which looks out onto the river Thames and is an all-around luxurious and elegant setting. The couple wished for us to decorate the room with contemporary fishbowl designs that linked to the groom’s Irish background. 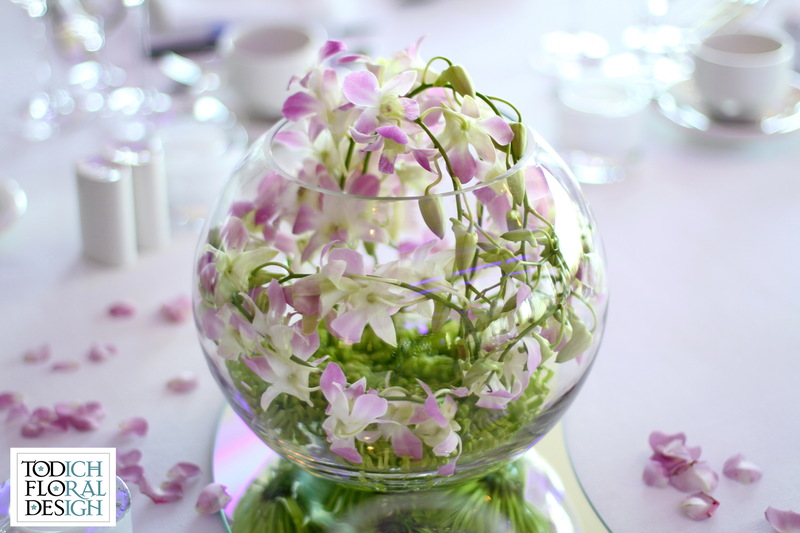 Our florists created contemporary fishbowl designs that were placed on mirror plates at the centre of the tables. 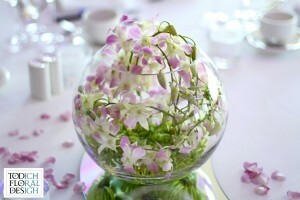 Shamrocks blooms sat at the bottom of the fishbowl vases whilst the dendrobium orchids swirled around the inside and over the tops of the vases, the florists finished the designs by scattering pink and cream rose petals all over the tables. The church was in Highbury, London and our requirement was to decorate the venue with 2 grand floral plinth designs and 8 small pew end arrangements. 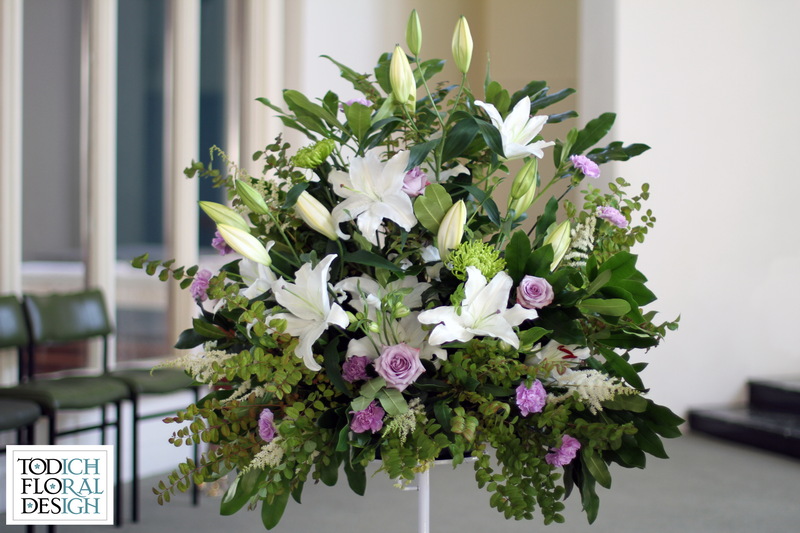 The plinth designs stood at the front of the alter and we wanted to make the displays as eye-catching and as beautiful as possible, the plinth arrangements included white lilies, cream freesias, lilac roses, lilac carnations, cream alstroemeria and seasonal scented foliage. The pew ends were small posy arrangements which included striking green chrysanthemums, lilac carnations, white astilbe and stems of fresh mint. 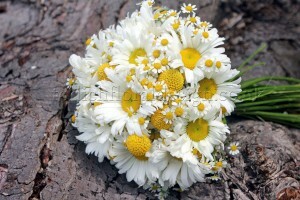 The bride and groom wished to smell the mint as they walked up the aisle on their wedding day. 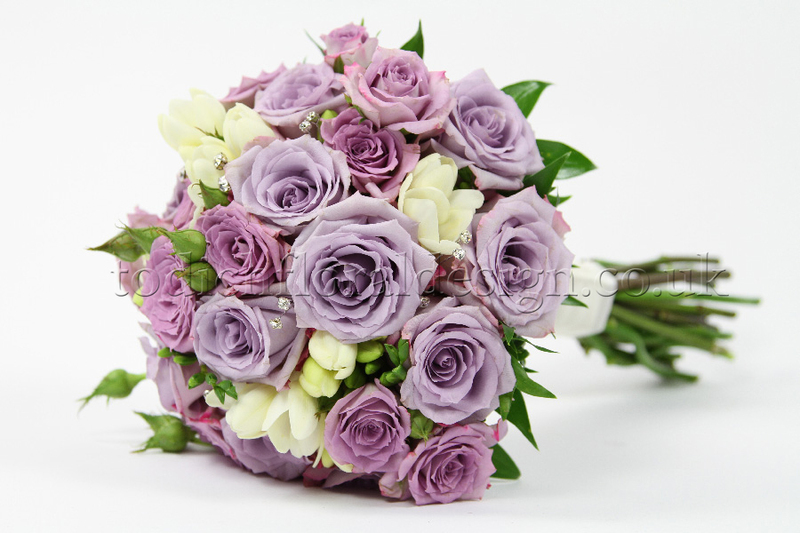 Overall the blend of purples, lilacs and creams really worked beautifully together, the added punch of lime green created striking eye-catching table arrangements that looked elegant and contemporary, and the use of roses kept the wedding theme traditional and stylish. 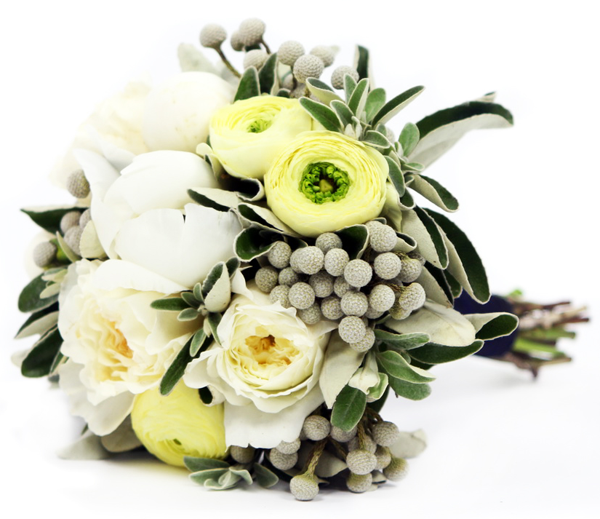 If you would like us to provide flowers for yourself for an upcoming wedding then please do not hesitate to get in touch, we would be happy to book a free consultation with you and talk you through any ideas that you have in mind.